No soaking required, dried red beans can be turned into tender enough with “sandy” consistency just around an hour. Are you intrigued to try? 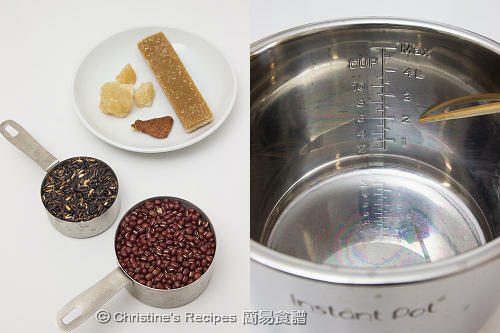 If you are like me, here's a quick recipe for making red bean dessert with a pressure cooker. If you still want to make red bean dessert over stove top, please see the notes below the recipe. Whenever I make our traditional Chinese red bean soup, I need to soak the beans for at least 3 hours or overnight before cooking about one to two hours, depending on how I like the consistency. I’m a big fan of all kinds of red bean desserts but couldn’t make any if without any planning ahead. So I searched the internet high and low and tried to see if there’s a kitchen gadget that could help me out. After searching for a while, I finally made the decision and bought this electric pressure cooker, Instant Pot. It’s got multi-functions including a high-pressure-cook mode. Making a stew dish within minutes is the best job that can be done in a pressure cooker. Yet cooking beans might be a challenge for it. You might be like me. I’m afraid of cooking beans in a pressure cooker as the increased volume or bits of broken bean skin might get stuck in the valve. So it’s very important to follow the instructions in the product manual, not to put too many red beans and water into the pot. How was the outcome? I was quite impressed with the cooked beans after finishing one cycle of “porridge” function. The beans were so tender and kept intact. The cooker needs 20 minutes to raise the pressure and heat inside, another 20 minutes to cook. I used the natural release of pressure that spent about extra 30 minutes. The total cooking time counting from putting all the ingredients in until the dish can be served was 70 minutes. If you’re like me going for the traditional “sandy” texture, you need to do one more simple step. Overall, it’s not bad for me especially when I crave for a red bean soup on a hectic day, originally required long-hours of preparation and cooking. For those who don’t use a pressure cooker, I inserted the instructions how to make this classic Chinese dessert on stove. Hope you all like it. Soak mandarin peel until softened. Use a knife to scrape away the inner white part as it tastes bitter. Rinse the red beans and black glutinous rice. Drain well. Some of my facebook fans asked where I got my Instant Pot. I got it from Amazon (UK) as the model for sale in UK, with 220 volts, suitable for using in Australia. Dried mandarin peel is sun-dried mandarin peel, available at Asian grocers. Or you can make it yourself. If you don’t have any in hand, you can skip it. The sweetness of rock sugar is light and refreshing, whereas brown slab sugar is rich and aromatic. You may choose and use only one of them. Both are available at Asian grocers. Whenever you cook beans in the pressure cooker, remember to use natural release. Don’t release the pressure yourself. 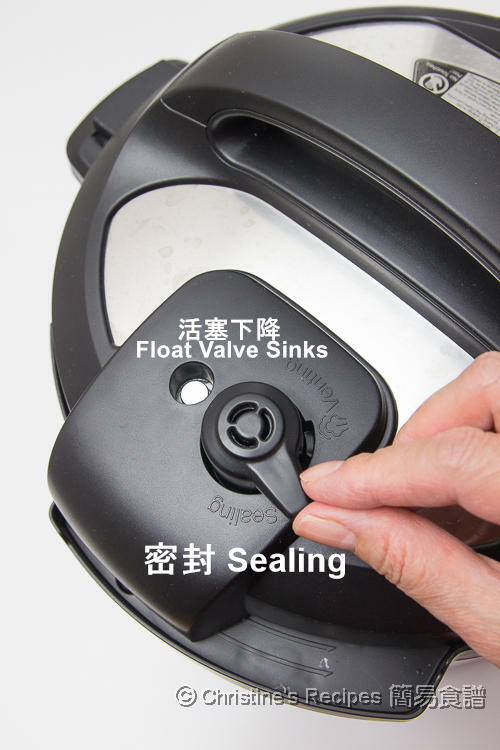 The boiling water might spill out from the valve. The natural release time may be around 15 to 30 minutes, depending on the quantity of the cooked ingredients inside. When you see the float valve drops to down position. Then you can open the lid. I love the texture of this red bean dessert. It looks very yummy. This sounds so delicious! Will def try this! Do you know if you can make green/mung bean dessert with instant pot? It works with green bean dessert too. Hi Christine, red bean soup is one of my favourite Chinese desserts. When is the best time to add the coconut milk and how much? I like to keep the red bean soup and coconut milk separately. I add the coconut milk as much as I like when I have it. An Instant Pot Recipe! Yay. I didn't think to use my instant pot for this, I will definitely try it. Please post more recipe using instant pot. I would love to use it more. Thank you! Yes, more Instant Pot recipes will be coming your way. Thanks for following my blog. I love this recipe but i don't have an instant pot, how do you do it over stove top or a slow cooker? Thanks for your love of my site. I've put the stove top instructions at the end of method section, step 3, for those including you, who want to make this dish without an instant pot. have tried 3 times cooking red bean soup in regular pressure cooker before and half way cooking the pot explode and all the red bean soup is every way in the kitchen. Quit using the pressure cooker after the 3rd time. Oh bad. Feel sorry to hear about your bad experience. Was it a stovetop pressure cooker? I found this electric one is quite easy to use, not too much trouble even for my first attempt. And whenever I cook bean soup or congee, I need to use natural pressure release. That means let it cool down naturally. Then you're good to open the lid. You have great recipes! I've never tried it with black glutinous rice. Can I buy that in Asian store? Could I add small tapioca? Black glutinous rice is perfect for making this dessert soup. Give it a try. Yes, it's available at Asian grocers. Small tapioca is good for making dessert with red bean too. If you do not have any glutinous rice, how much water do you add instead? Sorry, don't have any record in hand. You may try decreasing 1½ or 2 cups of water. See how it goes. Hi Christine, I am having the Breville Fast-slow Pro, they don't have porridge function, but they have beans function. do u happen to know which function to make this? Too bad I don't have the same instant pot as yours,I am new to this toy! I need to figure out how to use still! I don't have your brand of cooker at home. So can't tell what "function key" you have to press. I think it's more of less similar. Use high pressure cooking, and adjust the cooking time. I tried your recipe this past weekend. I doubled the ingredients and used the porridge function. I also wanted sandy texture; so after the soup was done and natural release has finished, I selected the saute function to let it cook for 10 mins. Then I switched to slow cook 30 mins (minimal setting) as I needed to walk away. When I came back the soup has become smooth and sandy as I have wanted. I like the Instant Pot. It is a great tool. I look forward to seeing more your Instant Pot recipes coming. 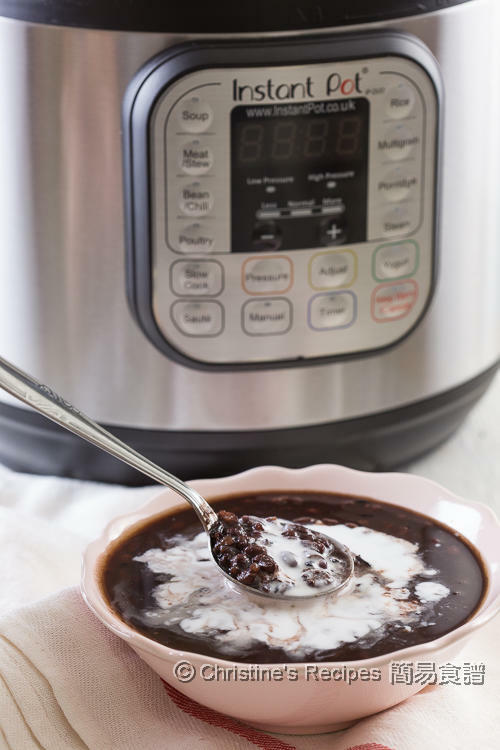 Thank you for the red bean soup recipe and the sharing of your cooking experience with the Instant Pot! So glad that you loved my recipe and sharing. The sandy texture is what we enjoy traditionally. This machine is so good to help us make this classic Chinese dessert without any fuss. Will keep more yummy Instant Pot recipes coming. Btw, have you subscribed my blog? Then you won't miss any updates. I added 2 liters of water. 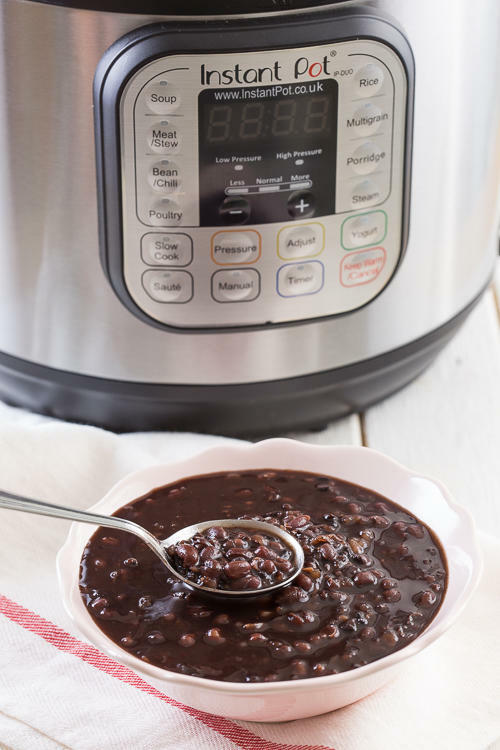 Hi, do you have sn instant pot grean bean soup recipe?